False-color image of a rare early Quadrantid, captured by a NASA meteor camera in 2010. The first meteor shower of 2012 — the lesser known Quadrantid meteor shower — will kick off a new year of skywatching when it peaks on Wednesday (Jan. 4). While many meteor displays in 2011 were washed out by a bright moon, the Quadrantid meteor shower is expected to put on a spectacular light show, with no pesky moonlight to interfere. The peak of the Quadrantids will occur at around 2 a.m. EST (0700 GMT) on Jan. 4. If you're planning to stay up late to catch the peak, you could be treated to meteors at a rate of 100 per hour, NASA officials said in a statement. Luckily, the waxing gibbous moon will set at around 3 a.m. local time, so as long as there are clear skies, conditions should be ripe for meteor watching into the pre-dawn hours. The sky map available here shows where to look to see the Quadrantid meteors. Unlike the more well-known Perseid and Geminid meteor showers, the Quadrantids last only a few hours, so skywatchers have a narrower window of opportunity to spot them. Meteor showers occur when Earth travels through leftover debris from comets or asteroids. They are often known as "shooting stars," because of the way they streak across the sky. As Earth passes through, dust and debris will enter the planet's atmosphere a blistering speed of about 90,000 miles per hour (almost 145,000 kilometers per hour). These fragments will burn up about 50 miles (80 km) above Earth's surface, NASA officials said. Because of the location of the radiant, at the northern tip of the constellation Bootes, only northern hemisphere skywatchers will be able to see Quadrantids. The Quadrantids were named after the constellation of Quadrans Muralis, the wall quadrant, which is located between the constellations of Bootes and Draco. Quadrans Muralis was named by the French astronomer Jerome Lalande in 1795. The constellation represents an early astronomical instrument that was used to observe and plot stars. Interestingly, the constellation is no longer recognized by the astronomical community, but the name lives on with the January meteor shower. 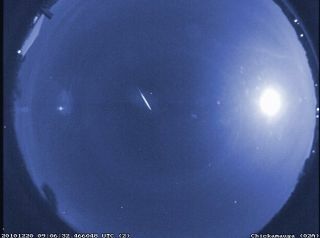 Editor's note: If you snap an amazing photo of the Quadrantid meteor shower would like to share it with SPACE.com, contact managing editor Tariq Malik at tmalik@space.com.